THERE’S FAST, AND THERE’S HYPERSONIC. 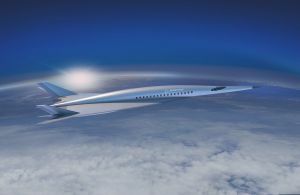 On Tuesday, Boeing unveiled its first concept design for a hypersonic passenger jet during the American Institute of Aeronautics and Astronautics (AIAA) conference in Atlanta. The vehicle could theoretically travel at Mach Five, or five times the speed of sound (6,174 kmh/3,836 mph). At that speed, a flight between New York and Tokyo that currently takes 14 hours would drop to just a couple of hours, according to a Popular Mechanics report. IT’S (NOT) ALL IN THE DESIGN. So how is Boeing’s design going to be able to reach these speeds? As Boeing’s Senior Technical Fellow of Hypersonics Kevin Bowcutt told Popular Mechanics, the craft uses a specific type of engine known as a ramjet, a staple of many hypersonic vehicle designs. He also explained how the hypersonic jet’s sharp front-end design would produce minimal drag while its split tail would help to stabilize and steer the vehicle. LOTS OF PLANS. NO PLANES. Boeing is far from the only company considering a future in which we travel at Mach Five. In June 2017, Lockheed Martin announced plans to begin development on the SR-72, a hypersonic military aircraft, though it doesn’t expect the craft to be airborne until 2030. In February, researchers in China successfully tested a scaled-down version of their hypersonic I Plane in an air tunnel, reaching a speed of Mach Seven. That craft could also facilitate military operations, a source told the South China Morning Post — if it ever goes into development. Boeing’s newly unveiled passenger plane could transport soldiers or civilians, according to Popular Mechanics, but both groups have quite the wait ahead of them — the craft likely won’t be ready for takeoff for another two or three decades.